Room 8 is decorated in the style of bedrooms from fine English country homes. A massive king sized bed greets you when you enter the room. The rich poster headboard is offset by 2 bachelors chests. Antique finished brass lamps complete the presentation. As you enter the room to your right you will encounter a dressing chest. 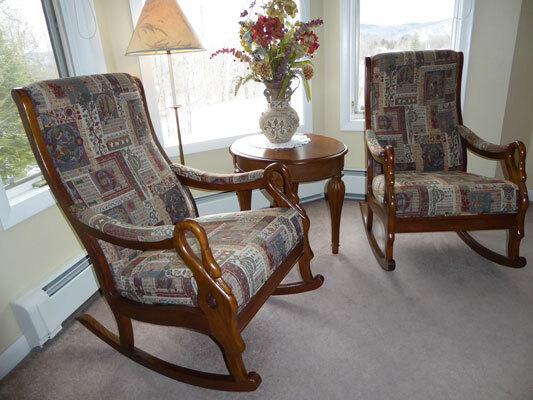 In front of you is the bay window with 2 upholstered rocking chairs. The bay window overlooks the Covered Carriageway and gardens with mountain tops across the Roaring Brook Valley in the distance. The trees on the surrounding mountains are a mix of hardwoods. During the summer months they provide a lush green backdrop. In the fall they come alive with vivid colors. And, of course, in winter they are dressed in a white covering of snow. 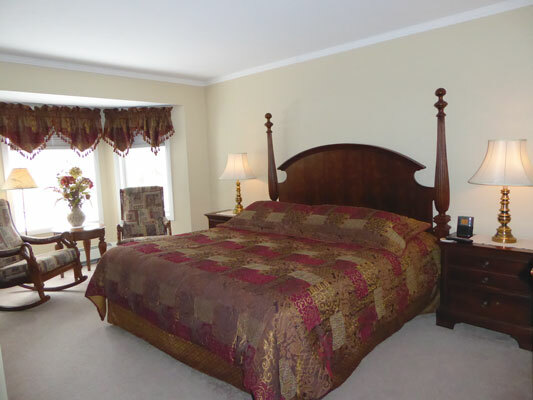 Room 8 also features a large bathroom that is equipped with a corner whirlpool tub for 2 . The tub also has an integral shower. Crystal lamps complete the bathroom. For some relaxation, try a little champagne, a hot, bubbling whirlpool.......you get the idea. 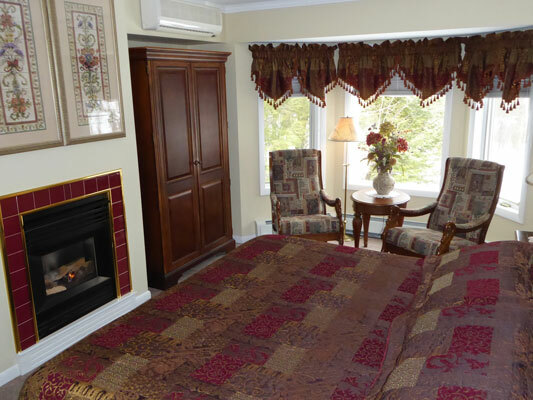 To complete Room 8, you will also find a fireplace at the foot of the bed. A massive armoire sits in an alcove beside the fireplace as the room's closet. Room 8 is also air conditioned for the summer months. Of course, Room 8 is also equipped with complimentary WiFi internet access, an alarm clock with a usb charging port and HD television. As is the case in most of the rooms at Birch Ridge, the television is completely hidden from view when you enter . Your entire visit could be spent without even knowing that it is there. Use our Room Rate Calculator to begin planning your stay in the English Gentleman's room at the Birch Ridge Inn at Killington.